Kids Fondue theme dinner party. 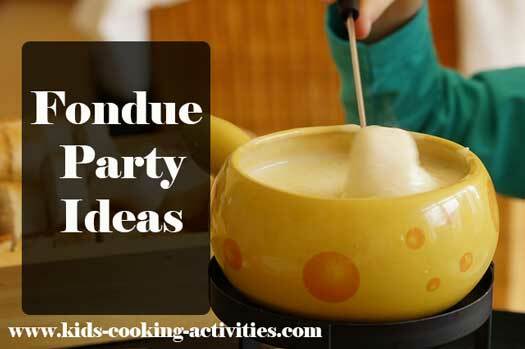 A fondue theme dinner party is easy to put together and something that will provide fun for all ages. Fondue comes from the French language meaning "to melt." 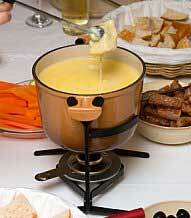 Fondue can be made in a special fondue pot but can also be created in a crock pot, microwave or saucepan. If using the microwave or saucepan place pan or microwave bowl on a electric hot plate. Set on low and stir often. Use your Fondue pot as your centerpiece. Include sticks for your food and have each family member or guest pick out a dipper to bring to the party. Ideas could be bread cubes, ham chunks, chicken cubes, fresh vegetables or one of the dessert dippers below. Try using a muffin tin to serve fondue. It is a perfect size for kids to add a little fondue in a hole and different dippers in each hole. This works great when you have more than one kid dipping in the fondue pot. This way they have their own cup to dip in and no worries about double dipping! 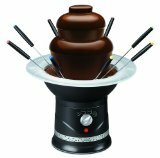 For your fondue theme dinner try making the party into a fondue and game night. Bring your friends and family around the table and teach them a new card game or play one of your favorite old ones. 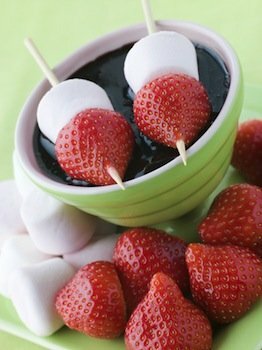 (Go Fish is our favorite) Experiment with some of these yummy fondue recipes. In saucepan add chicken broth and garlic together. Allow to heat. Turn heat to medium-low and add cheeses. Stir constantly until melted. Add salt and Worcestershire sauce. In separate glass or bowl add cornstarch with cold chicken broth. Whip together. Blend into cheese mixture and stir until well blended. Pour into a fondue pot or crock pot. Serve with French bread or other dippers. Serve immediately with French bread or sourdough bread cubes and cut up vegetables. Sliced fruits such as strawberries, bananas, peaches, etc. Melt chocolate chips and half and half in a microwave safe dish. Stirring often. Add vanilla extract and pour mixture into a fondue pot or crock pot. Serve with dippers. Rub crock pot with butter. Put in candy bars, marshmallows and milk. Cook for 30 minutes until melted. Add cream and keep lid on to keep warm until serving. Dip strawberries, pound cake, bananas, apple slices or marshmallows. Mix caramels and cream in crock pot. Cook for 1-2 hours stirring several times. Add marshmallows 30 minutes before serving. Stir to combine. Dip apple slices, marshmallows, pound cake or bananas in fondue. Mix ingredients together and warm in crock pot or saucepan on low. Serve with small pieces of angel food cake. Melt 1 Cup butterscotch chips and 1 Tablespoon milk, in microwave for one minute intervals stirring often until smooth. Dip strawberries, apple slices or bananas. Microwave a can of chocolate frosting until fairly runny. Use to dip cake pieces, fruit bites, pretzels, etc. Very yummy dessert. Take me back to theme dinner ideas from fondue theme dinner.